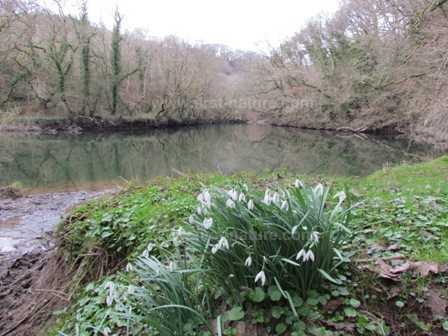 This NNR can be accessed from either bank of the lower reaches of the River Teifi, which is classed as a SAC in its own right because of the fish and plant species that live in it. Whichever route to this NNR you choose, a stroll along the paths on the banks of the river is a real treat. In spring the woodland is full of flowers and birdsong, and in autumn there is a wide variety of colourful fungi to enjoy. 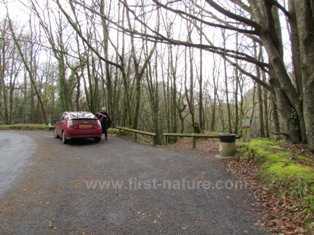 The site is managed jointly by Natural Resources Wales (NRW) and the Wildlife Trust of South and West Wales (WTSWW). For the north bank - from Cardigan take the A484 main route towards Carmarthen. At the village of Llangoedmor there is a right hand turn on to an unnamed road which travels around in a semi-circle to Llechryd. Approximately 1km (2/3 mile) along this road there is a layby on the right with access into Coedmor NNR. For the south bank - there are two points of entry. One is from the village of Llechryd, which lies between Cardigan and Cenarth on the A484 Cardigan to Carmarthen road. When travelling from Cardigan towards Carmarthen turn right over the River Teifi at the bridge in Llechryd. At the far (southern) side of the bridge there is a left turn into a lane with a small layby on the right hand side, where it is sometimes possible to park two or three cars. The walk along the southern bank of the Teifi can be accessed from the side of the bridge. The other entry for for the walk along the south bank of the Teifi is from the centre of the village of Cilgerran, which is about 4.5km (3 miles) from Cardigan. Cilgerran is signposted from the A478 Cardigan to Tenby road. In the village centre there is a riverside car park with direct access to the river walk on the south bank of the Teifi. There are well-defined paths throughout the reserve but they are steep in places and can be slippery in wet weather. Some parts of the paths have steep and uneven steps and none of them is accessible for people with prams or pushchairs or for wheelchair users. The Coedmor NNR was established to protect the ancient woodland that clings to the steep banks of the lower reaches of the River Teifi. The woodland is dominated by Sessile Oaks, but other trees there include the Wild Service Tree, Small-leaved Lime, Ash and Wych Elm. Garden escapes of Rhododendron and Cherry Laurel have invaded some parts of the top of the gorge, and both of these highly invasive shrubs are being controlled so that they do not crowd out the natural plants and trees of the woodland. The wooded gorge has high levels of humidity because of the presence of the river, and during the summer this level is maintained by the tree canopy which limits evaporation by the sun. As a result the woodlands are a mecca for mosses, ferns and huge numbers of lichens - more than 200 species have been recorded in the area. 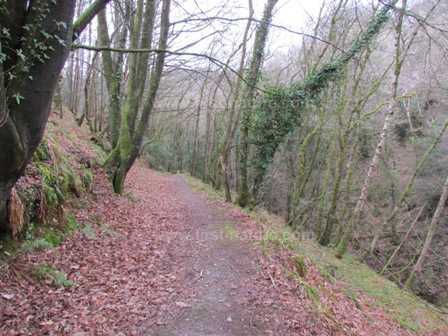 Throughout Wales there are several examples of this type of woodland, and they are frequently protected as nature reserves or by means of other designations that reflect the importance of this habitat both nationally and internationally. Along with many other of these woodlands, Coedmor is a haven for bats which roost and raise their young in these wooded, rocky gorges. On summer evenings you can see bats hunting for the small insects they feed on throughout the entire course of the River Teifi. These so-called 'Atlantic woodlands' support a wide variety of birds, especially during the summer when many visit the woods to nest and raise their young. Amongst the visitors are Redstarts (Phoenicurus phoenicurus), Pied Flycatchers (Ficedula hypoleuca) and Spotted Flycatchers (Muscicapa striata). Coedmor is also a good place to hear the Great Spotted Woodpecker (Dendrocopos major) from early spring onwards, and if you are really lucky you will also hear Cuckoos along the Teifi Valley. In quieter, shallow parts of the River Teifi Grey Herons (Ardea cinerea) wait patiently for food, in the form of small fish, to swim in their direction. Another special feature of this area is its Otter (Lutra lutra) population. One of the reasons for the Teifi's designation as an SAC is because of its Otters. It is unusual to see these shy creatures during day, but when the river is low look out for their footprints in muddy margins of the river. If you are a Sea Trout angler - and the Teifi is one of the top UK rivers for Sea Trout - and out fishing at night you are much more likely to have a close encounter with an Otter. They can be heard running over gravel spits in some parts of the river, and it is certainly not uncommon to hear one on the far bank crunching up the fish that you had hoped to catch! Whether you are an angler or not, this lovely nature reserve and the whole of the Teifi Valley is bursting with beautiful scenery and wonderful places to get out and enjoy the countryside and the wildlife that shares it with us.